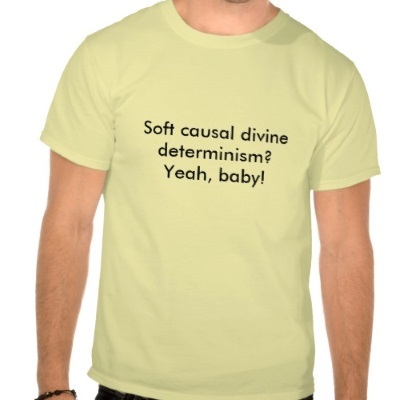 Creating a Calvinist T-Shirt « Analytic Theology, et cetera. My friend James Anderson recently wrote two nice posts on theological determinism and compatibilism. I direct the reader to those posts for all the nitty-gritty details. The purposes of his two posts were to chop up the conceptual space surrounding the theses of divine determinism and compatibilism. In this post I want to add to his work of conceptual carving. I will add to the distinction between hard and soft determinism that James drew, the further distinction between hard and soft compatibilism. Before continuing, I want to add a caveat up front: I don’t take it that I’m offering any substantive criticism of James’ posts. I merely hope to add to his project of carving conceptual space. However, as you’ll (hopefully) come to agree in the end, I think my t-shirt will be both conceptually and aesthetically superior to James’! Caveat Lector: In what follows I’ll just speak of freedom being (in)compatible with determinism. I won’t mention moral responsibility. There are some important distinctions here, but I’ll let them pass for ease of exposition. However, when you read what follows, you can insert “and/or moral responsibility” after instances of “freedom,” if you’d like. [W]e can define ‘soft’ and ‘hard’ determinism as follows: soft determinism is compatibilist determinism and hard determinism is incompatibilist determinism. In other words, soft and hard determinists agree that determinism is true, but they disagree about whether free choices are possible given that determinism is true. For what follows, I want to make some tangential points to James’ discussion. I am not intending to criticize his discussion, merely elaborate upon in. Hopefully what follows will be of some use for when you think through these issues. Recently, hard and soft determinism have taken a hit in numbers. This is because (a) what does the determining has most often been taken to be the laws of nature (L) conjoined with propositions about the (remote) past (P), call this thesis nomological determinism. (b) nomological determinism entails the state of the world at all times, and (c) quantum physics seems to show that that kind of determinism is false. Moreover, for the most part, it is now probably better to refer to ‘hard incompatibilism’ as opposed to hard determinism. Hard incompatibilism names the thesis that freedom is incompatible with both determinism and indeterminism. But even here we can chop up the space more finely. For example, some hard incompatibilists think that it is a contingent fact about us or the world that renders freedom incompatible with determinism and indeterminism (Derk Pereboom, for example). Others maintain that it is simply impossible for any agent (even God!) to be free (Galen Strawson, for example). Thus, Kadri Vihvelin has said we out to add a third category here, viz., ‘impossibilism’. Let impossiblism name the thesis held by those like, e.g., Galen Strawson. However, that said, hard determinists do seem to be making a bit of a comeback, though in a nuanced way. Many neuroscientists admit that quantum indeterminism renders the global determinism represented by nomological determinism (defined above) false. But from the fact that global determinism is false it does not follow that local determinism is false. The world as a whole can be indeterministic, yet there can be pockets of determinism within the world. And it is claimed that such a pocket exists in the human brain. Call such a determinism, neurological determinism. And, it is said that the evidence from neuroscience shows that we couldn’t be free and morally responsible. So this form of hard determinism will deny that ‘determinism is true/false’ absent any qualification. Nomological determinism (as defined above) may be false, but neurological determinism is true, and that fact undercuts our having free will. There are other complications as well. In one recent paper, Jeremy Koons argues that hard determinism is actually a form of compatibilism (see his “Is Hard Determinism a Form of Compatibilism?”, The Philosophical Forum (Volume XXXIII, No. 1, March 2002, pp.81-99)! I won’t offer a précis of his argument, since all this has been complicated enough! James states that, “Admittedly that doesn’t exactly roll off the tongue, and I can’t see the t-shirt catching on, but at least it has the virtue of philosophical precision!” In the common quest for philosophical precision, I’d like to introduce another distinction to add to our t-shirt. James’ t-shirt expands on the kind of determinism he thinks Calvinists should affirm, but it is silent on the kind of compatibilism. Of course, as you will hopefully see, James’ description may entail the relevant compatibilism, and so it need not be stated. But, for sake of philosophical precision, we might want to. In any case, that James didn’t go into this discussion affords me an opening to do so. My motive here is to expand on James’ posts, and I hope he finds these additions helpful to his project! Here’s the distinction I want to invoke. 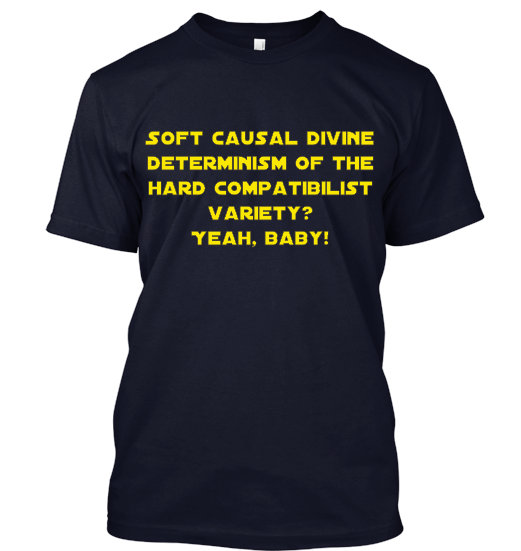 A compatibilist can either be a ‘soft’ or a ‘hard’ compatibilist. In the literature, these terms actually have multiple meanings. One meaning is this: hard compatibilism is the thesis that determinism is required for freedom and responsibility. On this view, the “freedom no matter what” view is false. It is an interesting question whether Calvinism entails this form of compatibilism. There’s a case to be made that it does. I won’t bother with the details here, though needless to say I think this question is worthy of discussion. We might take our starting point from WCF 3.1, where we’re told that God’s eternal decree establishes human freedom. Interesting questions also arise when we consider the nature of God, his aseity and knowledge, for example. Further elaboration will need to wait for another time. Here’s another type of hard compatibilism: Consider first the recent debates in the compatibilism literature that have focused on whether freedom and responsibility is compatible with manipulation. There is an argument for incompatibilism that goes something like this: freedom/responsibility is incompatible with manipulation. Causal (nomological) determinism is relevantly analogous to manipulation. Therefore freedom/responsibility is incompatible with causal determinism. Of course, ‘manipulation’ is a problematic term, conveying negative connotations that could prejudice one’s intuitions. But for our purposes, we can define it in fairly neutral terms. Let manipulation name that thesis that some person S is determined to do action A, and a s is determined to do A ultimately by some cognitive agent who intentionally determines S to do A either directly or indirectly, by using some deterministic process to get S to do A. On this definition, divine determinism qualifies as a type of manipulation. Now, in the literature, there are two broad responses to manipulation argument. One is the soft compatibilist response and the other is the hard compatibilist response. Put parsimoniously, the former response argues that causal (nomological) determinism is not at all analogous to manipulation, and so while freedom and responsibility are compatible with causal (nomological) determinism, it is incompatible with manipulation, even if the manipulator uses causal (nomological) determinism (as in Alfred Mele’s argument from the goddess Diana). The latter response can get fairly complicated, but at the risk of simplification, it claims that freedom and responsibility can be compatible with cases of manipulation. It seems that theological compatibilism is a type of hard compatibilism. What do you say, James? Would you wear this one? I gave it a “Star Warsy” look. By Paul in Calvinism, Compatibilism, Determinism, Incompatibilism, James Anderson on July 19, 2014 . Paul Manata provides some gentle nuance for something that James Anderson said in the “determinism” vs “compatibilism” discussions.